Crude prices this morning are $44.56, down $.96 (2.1%)from yesterday’s close of $45.52. Crude opened this morning at $45.35, very near it’s $45.65 opening level yesterday, and has been falling for much of the day. 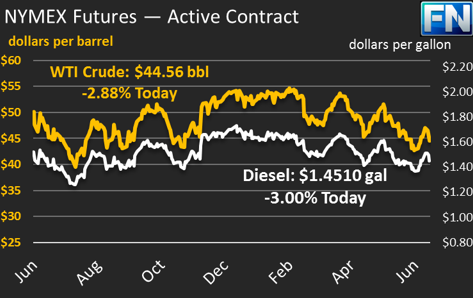 Diesel price are $1.451, with a significant loss of $.0313 from yesterday’s close. 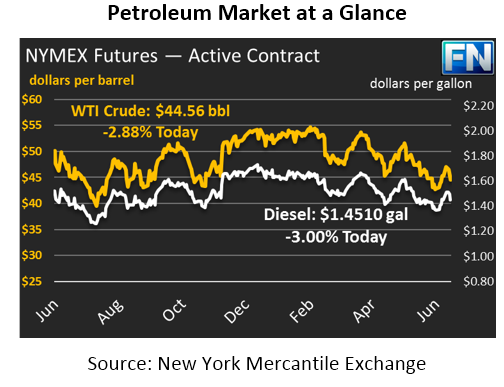 Prices opened this morning at $1.4775, and have tracked crude markets lower. Gasoline prices are $1.498, also losing over $.03 since yesterday. Prices opened at $1.524, $.026 higher than current prices and slightly higher than yesterday’s opening price. Yesterday, the EIA released a strongly bullish inventory report, showing large across-the-board stock draws. Crude inventories fell 6.3 million barrels (MMbbls) to 502.9 MMbbls, down 6% from this year’s high of 535 MMbbls. Diesel inventories fell 2.1 MMbbls to 133.7 MMbbls, down over 10% from this year’s highest reported diesel inventory level. Gasoline inventory fell 3.7 MMbbls to 237.3 MMbbls, down 7.7% from February’s peak inventory. Overall, crude and all refined products combined declined by 12.1 mmbbls. Approximately 1.2 mmbbls of this drop was attributable to falling imports amid tropical storm concerns. The fact that prices have fallen so precipitously this morning, even after the large stock draws, bodes well for consumers. Market sentiment appears to be strongly bearish, despite the fact that stocks are being drawn down to their historic levels. International leaders are meeting today in Germany for the G20 Summit, gathering to discuss key topics like trade and climate change. This week, the EU and Japan signed a free trade agreement, which bodes well for international demand. Of course, much of the attention has been on President Trump, who is meeting with G20 leaders for the first time.